Happy Almost Mother's Day! I thought I'd share a feline photo of Mother/Child love -- Miss Sally Sparkles and her little girl, Rosebud. Cutie cute cute, right?? Nose kisses! I can't believe I was able to catch this with the camera. It looks like Sally has no eyes. She has eyes. How the World Says Hello poster. A Tiny Train made from teaboxes. LOVE THIS, I think I could do it. Hello Kitty Misha Lulu clothes. The most amazing picture frame I've ever seen. Darling craft book that promotes storytelling! Emily's site and work is lovely. Rhubarb Custard Pie is one of the best things I've ever eaten. My mom-in-law makes a wonderful version but I don't have her recipe written down yet. This one looks glorious. I am WAY into this blog. She has the perfect backyard. Cool Book of the Week: 'Peter in Blueberry Land' by Elsa Beskow. Have I talked about this one yet? I'm getting confused about which Elsa books I've discussed. I think I haven't done this one yet. I need to archive this stuff better. So sweet about Peter looking for berries to give to his mother for her birthday. Seems appropriate given the Mom's Day holiday coming up. He can't find enough berries so the king of Blueberry Land shrinks him down to mini-size and takes him on a berry picking adventure. HOW ADORABLE IS THAT?? Have a lovely weekend! Happy Mother's Day to all of you rad mamas out there! Kisses and loveys. Aren't those so unique Michelle? I really think they're neato mosquito. Awww, love the kissing kitties! Also, I really want that elephant print off the fairytale card link -- and the red brid crafts site looks awesome, gonna have to spend some time there. I don't think you've shared this Elsa Beskow before, of course it looks wonderful!! Happy Friday!! ps I want a slice of your mom-in-laws rhubarb pie. Happy Weekend to you! I need to cross check this recipe against hers and see if they are similar -- I think the general idea is the same. You need to have this deliciousness in your tummy! wow, lots of great stuff, I pinned a bunch of it!! And the kitties kissing. Just precious. Happy mother's day! 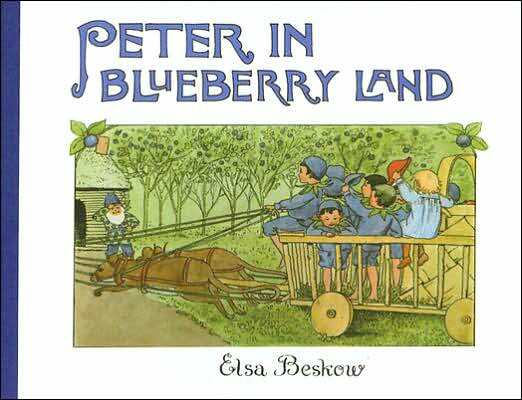 Peter in Blueberry Land was the first Elsa Beskow we ever read (library). I lucked into it at a used bookstore a couple years later. Excitement!